Impress the whole family by whipping up a sweet Vanilla Sponge Cake with Strawberry Compote - from scratch. Strawberry sweetness in one delicious cake! 1. 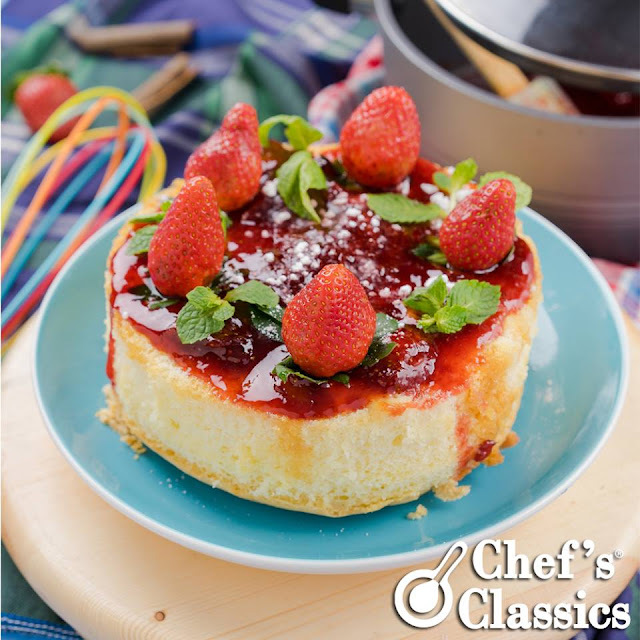 For the Strawberry Compote, heat Chef's Classics Safflower Sauce pan. Add in fresh strawberry, sugar and lemon juice. Let is simmer until thickens. Set aside and cool down. 2. Heat the oven to 180 C.
3. Grease 18cm or 7 inches round cake pan with a little extra butter and cut a pc of greaseproof paper to fit the base of the cake pan. 4. In a large mixing bowl, mix softened butter, sugar, vanilla extract, lemon zest and eggs. Mix well. 5. Add gradually flour, salt and baking powder. Mix well until batter is smooth. 6. Pour or spoon the mixture into the tin, smooth the top and bake on the middle shelf of the oven for about 30 to 45 minutes. The cake is cooked when it looks well risen and golden. The top should spring back when lightly touched with a fingertip. Another test is to insert a skewer into the center of the cake - it should come out clean. 7. Cool down cake, put strawberry compote top and some icing sugar. Serve chilled.